Colleagues, including my late father Jerome Stein of Brown University, students, and I are looking into various issues involved in trying to mitigate earthquake hazards. The challenge is to develop policies that make sense for society, given that we have limited resources, limited knowledge about earthquake processes, and thus limited ability to estimate possible future damage. The issue can be posed in terms of finding a level of hazard mitigation that minimizes total cost to society. That cost is the sum of mitigation costs, such as earthquake resistant construction or tsunami defences, plus the expected loss for future earthquakes assuming a given level of mitigation. The expected loss is the sum of losses in various expected events times the assumed probability of each event. As shown, the optimal level of mitigation is the minimum of the cost curve. Less mitigation decreases construction costs but increases the expected loss and thus total cost. More mitigation gives less expected loss but higher total cost. Similar situations arise for other natural hazards including river flooding and hurricanes, and in dealing with the effects of global warming. The optimal level of mitigation minimizes the total of losses and mitigation costs, and depends on the assumed hazard model. Our ability to find this optimal level of mitigation that balances resources used for hazard mitigation with other societal needs (schools, hospitals, etc. ), thus depends on our ability to estimate the probabilities of future events and their effects, and the uncertainties in these estimates. One of our key lines of research, discussed in the short video below, is exploring how to make policy given these uncertainties. For an overview of the work with Jerome Stein, click here for an article excerpted from the Brown Daily Herald. This work is also the subject of a new textbook “Playing Against Nature” (Wiley-Blackwell). Why Do Earthquake Hazard Maps Often Fail? The uncertainties in estimating hazards are illustrated by the fact that it is becoming increasing clear that standard earthquake hazard mapping methods often fail to predict what happens in large destructive earthquakes. We are exploring why this is the case. In general, the problem is that large earthquakes are much more variable in space, time, and magnitude than we often infer from the limited historical record. A striking example is the March 2011 M 9.1 earthquake off Tohoku, Japan, which occurred in an area shown by the Japanese national earthquake hazard map to have relatively low hazard. The short video below explains what went wrong and why. 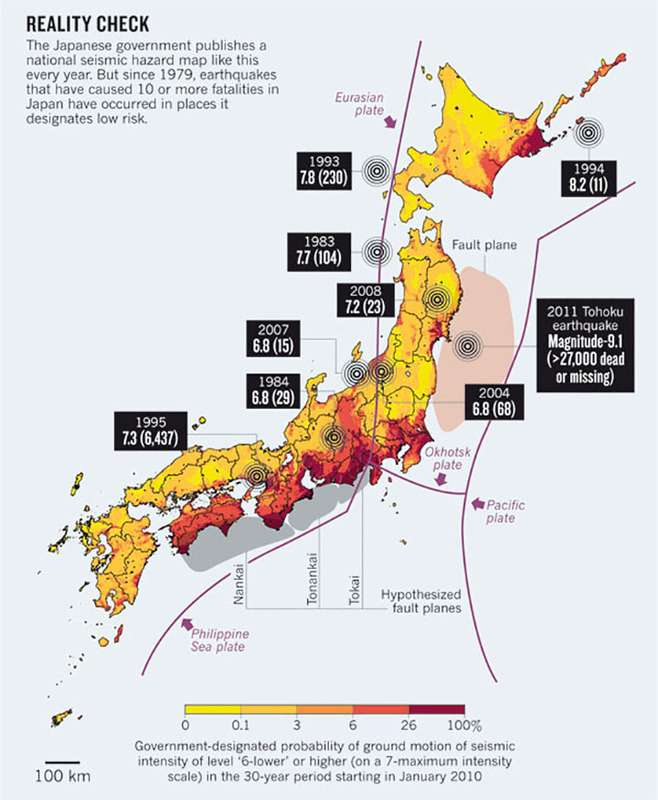 The hazard map reflected the assumption that magnitude 9 earthquakes would not occur off the Tohoku coast, which led to tsunami defences being built only for a much smaller earthquake than actually occurred, as described by the New York Times. A M9 earthquake involves more slip on a larger fault area, resulting in a larger tsunami because the maximum tsunami run-up height is typically about twice the fault slip (Okal and Synolakis, 2004). Thus the March earthquake generated a huge tsunami that overtopped even 10-meter sea walls, causing enormous damage including crippling nuclear power plants. (For a copy of a video showing the tsunami overtopping the seawall, click here). For our paper (Stein and Okal, 2011) about why the hazard mapping failed to expect a magnitude 9 earthquake, click here. Among the problems was the perception that such large earthquakes would not occur subduction zones like this, where the subducting plate is geologically old, as discussed here. A striking example, noted by Mian Liu (University of Missouri), is that the 2008 Wenchuan (Sichuan province) M 7.9 earthquake occurred on a fault predicted by the hazard map to have low seismic hazard. Another example is the convergent boundary between Africa and Eurasia in North Africa (Swafford and Stein, 2007). The 1999 Global Seismic Hazard Map showing peak ground acceleration expected at 10% probability in 50 years predicts a prominent hazard “bull-eye” at site of the 1980 M 7.3 El Asnam earthquake. The largest subsequent earthquakes to date, the May 2003 M 6.8 Algeria and February 2004 M 6.4 Morocco events (stars) did not occur in the predicted high hazard regions. The 2010 M 7.1 Haiti earthquake similarly occurred on a fault mapped in 2001 as having low hazard, producing ground motion far greater than the map predicted would occur in 500 years. As a result, new hazard maps are sometimes made after a big earthquake that the earlier maps missed. The question is whether and how much better the new map predicts than the older one, which may take a while – sometimes hundreds of years – to assess. 2014 overview “How much hazard mitigation is enough?” Click here. Short 2014 overview video “Recognizing and acknowledging uncertainty in natural hazard assessment” Click here. 2014 overview lecture “Why earthquake hazard maps often fail and what to do about it.” Click here for powerpoint. 5-minute video summary presented at the 2012 UNAVCO science workshop “Bad assumptions or bad luck: Tohoku’s embarrassing lessons for earthquake hazard mapping”. Click here to watch. Keynote lecture from the 2011 ESF conference on Extreme Geohazards: “Why natural hazard maps (forecasts, warnings, etc) often fail and what to do about it.” (Stein, S., R. Geller, and M. Liu). Click here to watch lecture or click here for powerpoint. 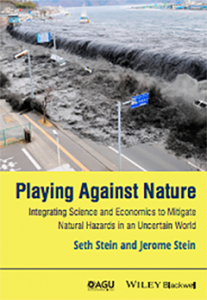 Lecture from the 2012 conference on mathematics in the geosciences: “Playing against nature: formulating cost-effective natural hazard policy given uncertainty” (Stein, S. and J. Stein). Click here for powerpoint. Listen to BBC radio story here. Neely, J.S., Stein, S.⁠, Merino, M., and Adam, J., Have we seen the largest earthquakes in eastern North America?⁠, Physics of the Earth and Planetary Interiors, 284, November 2018, Pages 17-27, 2018. Click here for link. Stein, S., M. Liu, T. Camelbeeck, M. Merino, A. Landgraph, E. Hintersberger and S. Kubler, Challenges in assessing seismic hazard in intraplate Europe, in Seismicity, Fault Rupture and Earthquake Hazards in Slowly Deforming Regions, A. Landgraph, S. Kubler, E. Hintersberger and S. Stein (eds), Geological Society of London, Special Publications series, volume 432, 2015. Click here for pdf. Stein, S., M. Liu, B. Spencer, and E. Brooks, Promise and paradox: why improved knowledge of plate tectonics hasn’t yielded correspondingly better earthquake hazard maps, in Plate Boundaries and Natural Hazards, Amer. Geophys. Un. monograph in press, 2015. Click here for pdf. Brooks, E., M. Diggory, E. Gomez, A. Salaree, M. Schmid, N. Saloor, and S. Stein, Should Fermi have secured his water heater?, Seism. Res. Lett., in press, 2015. Click here for pdf. Brooks, E., S. Stein, and B. Spencer, Comparing the performance of Japanese earthquake hazard maps to uniform and randomized maps, Seismological Research Letters, 87, 1, 2016. Click here for pdf. Stein, S., B. Spencer, and E. Brooks, Bayes and BOGSAT: issues in when and how to revise earthquake hazard maps, Seism. Res. Lett., 86, 6-10, 2015. Click here for pdf. Stein, S., B. Spencer, and E. Brooks, Metrics for assessing earthquake hazard map performance, Bull. Seismol. Soc. America, 105, 2015. Click here for pdf. Stein, S., J. Kley, D. Hindle, and A. Friedrich, Exploring natural hazard policies with bike helmets and bus fares, EOS, 96, doi:10.1029/2015EO027187, 31 March 2015. Click here for pdf. Stein, S. and A. Friedrich, How much can we clear the crystal ball?, Astronomy and Geophysics, 55, 2.11-2.17, 2014. Click here for pdf. Stein, J.L. and S. Stein, Formulating natural hazard policies under uncertainty SIAM/ASA J. on Uncertainty Quantification, 1, 42-56, 2013. Click here for pdf. Stein, S. and J.L. Stein, How good do natural hazard assessments need to be?, GSA Today, 23, no. 4/5, doi: 10.1130/GSATG167GW.1 (April/May), 2013. Click here for pdf. Stein, S. and J.L. Stein, Shallow versus deep uncertainties in natural hazard assessments, EOS, 94, 14, 133-140 (2 April), 2013. Click here for pdf. Stein, S., R. Geller, and M. Liu, Why earthquake hazard maps often fail and what to do about it, Tectonophysics, 562-563, 1-25, 2012. Click here for pdf. Stein, S. and R.J. Geller, Communicating uncertainties in natural hazard forecasts, EOS, 93(38), 361-362, 2012. Click here for pdf. Stein, J.L. and S. Stein, Rebuilding Tohoku: a joint geophysical and economic framework for hazard mitigation, GSA Today, 22(9), 42-44, October 2012. Click here for pdf. Stein, J.L. and S. Stein, Gray Swans: comparison of natural and financial hazard assessment and mitigation, Natural Hazards, DOI 10.1007/s11069-012-0388-x, 2012. Click here for pdf. This analysis comparing weaknesses in hazard assessment and mitigation policies shown by the Tohoku earthquake and 2008 U.S. financial disaster draws on concepts from the book Stochastic Optimal Control and the U.S. Financial Debt Crisis by J. L. Stein (Springer, 2012). Stein, J.L. and S. Stein, Formulating natural hazard policies under uncertainty, SIAM News, 45/10, 6-7, 2012. Click here for pdf. Stein, S., R. Geller, and M. Liu, Bad assumptions or bad luck: why earthquake hazard maps need objective testing, Seis. Res. Lett., 82, 623-626, 2011. Click here for pdf. Stein, S. and E. Okal, The size of the 2011 Tohoku earthquake needn’t have been a surprise, EOS, 92, 227-228, 2011. Click here for pdf. Liu, M., S. Stein, and H. Wang, 2000 years of migrating earthquakes in North China: How earthquakes in mid-continents differ from those at plate boundaries, Lithosphere, 3, doi: 10.1130/L129,2011. Click here for pdf. Stein, S., Why seismologists can’t predict earthquakes, 2010 Academy of Europe Lecture. Click here for pdf. Stein, S. and J. Hebden, Time-dependent seismic hazard maps for the New Madrid seismic zone and Charleston, South Carolina areas, Seis. Res. Lett., 80, 12-20, 2009. Click here for pdf. Swafford, L. and S. Stein, Limitations of the short earthquake record for seismicity and seismic hazard studies, in Continental Intraplate Earthquakes, Special Paper 425, 49-58, S. Stein and S. Mazzotti, eds., GSA, Boulder, CO, 2007. Click here for pdf. Stein, S., A. Friedrich, and A. Newman, Dependence of possible characteristic earthquakes on spatial sampling: illustration for the Wasatch seismic zone, Utah, Seis. Res. Lett., 76, 432-436, 2005. Click here for pdf. Stein, S. and A. Newman, Characteristic and uncharacteristic earthquakes as possible artifacts: applications to the New Madrid and Wabash seismic zones, Seis. Res. Lett., 75, 173-187, 2004. Click here for pdf. A. Newman, J. Schneider, S. Stein, and A. Mendez, Uncertainties in seismic hazard maps for the New Madrid Seismic Zone, Seis. Res. Lett., 72, 653-667, 2001. Click here for pdf.